Polandball, owaziwa ngokuthi countryball, iyinhlangano ngumsebenzisi meme Intanethi eladabuka on the / int / ibhodi imageboard German Krautchan.net engxenyeni yokugcina ka-2009. The meme kubonakala inqwaba amahlaya online, lapho amazwe ethulwa njengoba eyindilinga persona s ukuthi uxhumana in English ngokuvamile ephukile, wahlekisa eyeqisayo kazwelonke kwamaZwe, kanye izingxabano historical. Isitayela zamahlaya kungenzeka idluliselwe kokubili ngokuthi Polandball (by emhlanganweni, ngisho ezimweni lapho kungekho Poland phakathi abalingiswa cartoon) kanye countryball (noma, bebonke, countryballs). Emakhomiki Polandball ingabi abalobi kuchazwa, futhi ubani uyakwazi ukwenza omunye. Lokhu kuye kwaholela meme lokusakaza emasayithini ezehlukene kwi Internet, kuhlanganise Reddit. Amahlaya ingatholakala ibuye on Facebook, lapho izwe ngalinye page yayo siqu, ezifana USAball and UKball. Isibonelo a yamahlaya Polandball okuyinto ezinwetshiwe "Poland bengayi emkhathini" catchprase. Ukukhuluma yamahlaya Poland ngokujoyina European Space Agency ngo-2012. A yamahlaya Polandball okuyinto satirises Sweden-Finland. Polandball kuhlanganisa amahlaya kwamanye amazwe, kodwa by umhlangano la amahlaya ngokuvamile namanje ukubizwa ngokuthi Polandball,  nakuba zingabuye futhi abizwe countryballs. Amazwe nazo emelelwe balls,  nakuba Singapore uthatha uhlobo unxantathu futhi ubizwa ngokuthi Tringapore; the Empire German of 1871-1918 (on Facebook nakwezinye izindawo) noma theory Fourth Reich (on Reddit) iyinhlangano isikwele abade ngamehlo amancane futhi njengoba Reichtangle eyaziwa; Israel uthatha uhlobo a hypercube ngokuthi Israelcube (in reference to physics Jewish ); futhi Kazakhstan uthatha uhlobo isitini okuthiwa Kazakhbrick. Ngaphezu kwalokho, America umdlalo a pair of shades kanye United Kingdom ogqoka Ilensi eyodwa futhi isigqoko top. Asetshenziselwa Cue amabhola 1 kuya ku-8 ukumela amaqembu ezizwe zendabuko ngaphandle ubuzwe ethile. Ngokwesibonelo, ibhola 1 (yellow) umele East base-Asia, 7 ibhola (maroon) umele aboMdabu baseMelika kanye 8 ball (black) simele Afrika noma abantu abamnyama jikelele. Akunakwenzeka Ukuthi Kunezidalwa Kwamanye Zimelela ibhola 6 (green). Isibonelo a yamahlaya Polandball okuyinto libalula Crucifixion (Corpus Hypercubus) by Salvador Dalí, futhi yiziphi okubonisa Polish Ukufela ukholo mbono njengoba kuchazwe ngu Wojciech Oleksiak. Israel and lamaJuda ngokwesiko eboniswe njengoba hypercube. ↑ 1.0 1.1 1.2 1.3 1.4 1.5 Orliński, Wojciech (5 August 2014). "Wyniosłe lol zaborców, czyli Polandball" (in Polish). Gazeta Wyborcza. Archived from the original on 1 January 2012. http://web.archive.org/web/20120101071958/http://wyborcza.pl/1,86116,7462232,Wyniosle_lol_zaborcow__czyli_Polandball.html. Retrieved 6 August 2014. ↑ 2.0 2.1 2.2 2.3 Zapałowski, Radosław (15 February 2010). "Znowu lecą z nami w... kulki" (in Polish). Cooltura. Archived from the original on 5 August 2014. http://www.webcitation.org/6Rat4O7DW. Retrieved 6 August 2014. ↑ 3.0 3.1 3.2 3.3 Kapiszewski, Kuba (5 April 2010). "Fenomem — Polska nie umieć kosmos" (in Polish). Przegląd. Archived from the original on 5 August 2014. http://www.webcitation.org/6Rasv9f4k. Retrieved 5 August 2014. ↑ 4.0 4.1 4.2 4.3 Plomlompom, Nils Dagsson Moskopp Erlehmann & Christian Heller (2013). "MS-Paint-Comics" (in German). Internet-Meme : kurz & geek (1 ed.). O'Reilly Verlag. pp. 86–88. ISBN 978-3-86899-806-1. http://books.google.com.au/books?id=bRywAgAAQBAJ. Retrieved 5 August 2014. ↑ 5.0 5.1 5.2 5.3 Fisher, Max (25 July 2014). "Is there a series of irreverent political cartoons summing up the crisis?". Vox Media. Archived from the original on 6 August 2014. http://www.peeep.us/bd843cb0. Retrieved 6 August 2014. ↑ 6.0 6.1 Ryan, Emmet (4 March 2014). "Polandball is Reddit's answer to Crimea crisis". The Sunday Business Post. http://www.businesspost.ie/#!story/Home/News/Polandball+is+Reddit's+answer+to+Crimea+crisis/id/87198161-2385-315c-abda-d92435575507. Retrieved 8 November 2014. ↑ 7.0 7.1 Cegielski, Tomek (12 April 2011). "MEMY. Legendy Internetu" (in Polish). Hiro.pl. Archived from the original on 5 August 2014. http://web.archive.org/web/20110415014502/http://hiro.pl/magazyn/magazyn_zjawiska/memy.html. Retrieved 5 August 2014. ↑ Kralka, Jakub (11 May 2012). "Polski internet to potęga, po co te kompleksy?" (in Polish). Spider's Web. Archived from the original on 5 August 2014. http://www.webcitation.org/6RbymTi82. Retrieved 5 August 2014. ↑ 9.0 9.1 (in Russian)Infokam. 7 August 2014. Archived from the original on 8 November 2014. http://www.webcitation.org/6TvdlsKwi. Retrieved 8 November 2014. 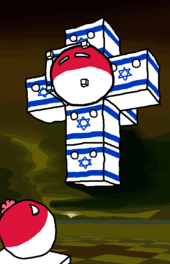 ↑ "Polandball cartoon". Unknown. http://www.webcitation.org/66ROeMOIC. Retrieved 26 March 2012. ↑ "Japon, Chine, vers une nouvelle guerre froide" (in French). France Culture. 9 March 2013. Archived from the original on 8 November 2014. http://www.webcitation.org/6Tve15wmz. Retrieved 8 November 2014. ↑ "Wybór Franciszka okiem internautów" (in Polish). Onet.pl. 14 March 2013. Archived from the original on 6 August 2014. http://www.peeep.us/037878fc. Retrieved 6 August 2014. ↑ (in Russian)Argumenty i Fakty (Volgograd). 6 August 2014. Archived from the original on 8 November 2014. http://www.webcitation.org/6TvdP3cDW. Retrieved 8 November 2014. ↑ "台灣最美麗的風景是人　真的嗎？ (Taiwan is one of the most beautiful landscapes, really?)" (in Chinese). Apple Daily (Taiwanese edition). 31 July 2014. Archived from the original on 6 August 2014. http://www.webcitation.org/6RcFSMpvN. Retrieved 6 August 2014. ↑ Klava, P. (25 August 2013). (in Russian)Vesti FM. Archived from the original on 8 November 2014. http://www.webcitation.org/6Tvc8mT6B. Retrieved 8 November 2014. ↑ 16.0 16.1 16.2 Oleksiak, Wojciech (9 June 2014). "Polandball — A Case Study". Culture.pl (Adam Mickiewicz Institute). Archived from the original on 6 August 2014. http://www.webcitation.org/6RcFd8k2j. Retrieved 6 August 2014. This page was last edited on 27 uNhlolanja 2018, at 19:50.